In January 2014, the International Livestock Research Institute (ILRI) announced formation of a global consortium supported by the Bill & Melinda Gates Foundation to develop a new vaccine against the tick-borne livestock disease East Coast fever, which kills more than one million cattle each year in sub-Saharan Africa. AllAfrica.com, a website that aggregates news from across Africa, featured on its homepage a photoessay that tells the story of the risks posed to the livelihoods of herders and farmers in Africa by East Coast fever as well as previous research attempts to fight the disease. Through this new USD11-million project, researchers plan to use recent biosciences breakthroughs in isolating proteins in the causative tick-borne parasite to develop a new-generation vaccine that will be more affordable and more widely adopted by Africa’s small-scale cattle keepers and herders. 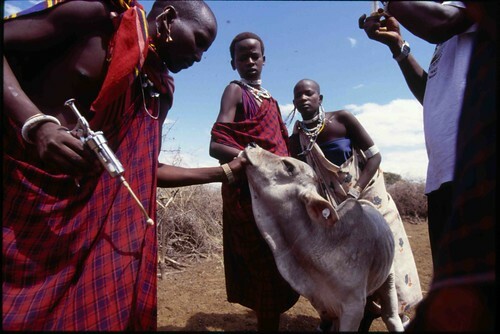 Read an ILRI news blog post announcing the new project: ‘Scientists launch multi-million dollar battle against African cattle killer’. Photo caption: A Tanzanian man helps administer the ‘infection-and-treatment method’ of immunizing cattle against East Coast fever in norther Tanzania (photo credit: ILRI/Stevie Mann). Tags: AllAfrica.com, BMGF. Bookmark the permalink.